Move over Drees Brees, there’s a new reigning NFL quarterback in town who now holds the highest paid salary record in NFL history. 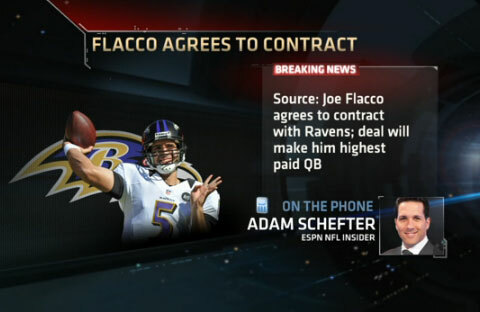 According to NFL Insider Adam Schefter, a source told him that Joe Flacco and the Baltimore Ravens have agreed to a six-year, $120.6 million contract making the Flacco the highest-paid player in NFL history. Ozzie Newsome, the Baltimore Ravens general manager, said both sides have settled on the parameters of the deal, but still have some language and details to work out, however, the deal will be signed on Mar 4, before Monday’s 4 p.m. franchise deadline. Flacco now surpasses New Orleans Saints QB, Drew Brees, who currently averages $20 million per year. If Flacco had been franchised, he would have earned at least $14.896 million this season. If you would like to book football speakers or NFL stars like Joe Flacco or Drew Brees for a speaking engagement or appearance, you can request Joe Flacco booking agent and speaker information from PFP Sports and Celebrity Talent Agency or call 800.966.1380.